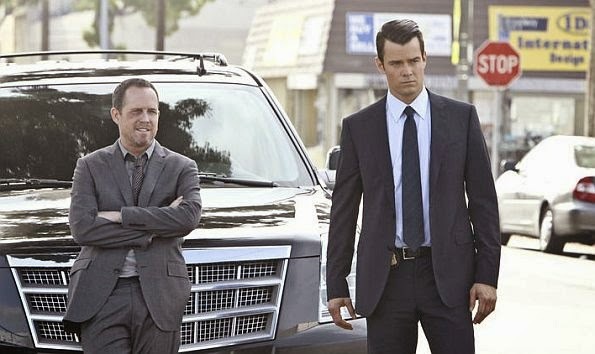 Dean Winters and Josh Duhamel star in Battle Creek, on CBS. Russ: "You can't be a cop and be this naïve. It's just not possible." I wasn't planning on writing on CBS's recent series Battle Creek, despite its notable pedigree – co-created by Breaking Bad's Vince Gilligan and House's David Shore. In the months leading up to its mid-season, March 1st premiere, mentions of Battle Creek in the press were afterthoughts in the build-up to the much more highly anticipated Vince Gilligan series, AMC's Breaking Bad spinoff/prequel, Better Call Saul. Indeed, the story behind the CBS series promised to be more interesting than the series itself: CBS dusted off a shelved spec script Gilligan wrote in 2002, years before Breaking Bad made Gilligan one of Hollywood's hottest commodities, and optioned Battle Creek into series just days before the acclaimed AMC hit aired its final episode. The story behind that story became more interesting still when months later, David Shore, creator of Fox's long-running cranky medical drama House, came on board to co-develop the new series with Gilligan. But as interesting as that story was, the premise of the new series remained altogether familiar, and even unremarkable: a mismatched buddy-cop comedy/drama set in a beleaguered police department. By the time the series premiered last month, I confess I'd completely forgotten to watch out for it, distracted by the evolving brilliance of Better Call Saul (whose 10-episode first season came to a triumphant close a few days ago). It was almost three weeks later that I finally watched the premiere episode, following an offhand recommendation from a friend. True to its lineage, Battle Creek turned out to be much more than the sum of its parts. It boasts a charismatic ensemble of actors, sharp and often hilarious writing, and a unique combination of unabashed sentimentality undercut with bitingly sharp edge. I quickly consumed all previously-aired episodes and the series soon joined a very short list of television shows I watch almost as soon as it airs. Unfortunately though, the series has been suffering from consistently weak ratings from the beginning and seems destined to join another, less vaunted, list of mine: television shows cancelled before their time. Battle Creek stars Dean Winters (best known for playing Liz Lemon's ex-boyfriend Dennis on 30 Rock) as Detective Russ Agnew, a jaded career cop in an underfunded police department in Battle Creek, Michigan. He's gruff – bordering on unlikeable – and he bends and breaks rules when it suits him, though largely as a result of the frustrating lack of resources at his disposal. Still, as irritated as he is the status quo, he's thriving in his own distinctively crusty way. All that changes when the powers-that-be dump FBI Special Agent Milt Chamberlain (Josh Duhamel, All My Children, Transformers) in Battle Creek to lend them a hand. Milt is a tall, by-the-book, movie star good-looking FBI agent who shows up with a chiselled jaw, confident smile, million-dollar crime-solving toys, and an apparently unyielding belief in the general goodness of man. Needless to say, Russ and Milt's get off like leftover frying oil and bottled water. Faced with a crime scene, Milt is all brains and tech, while Russ is all gut feelings and kicking in doors. Despite Russ' continuing mistrust of Milt – he's convinced that no-one can truly be as perfect as Milt appear – Battle Creek PD's clearance rate begins to steadily rise. If that were all the show was – an Odd Couple team-up of two good cops with incompatible personalities – Battle Creek would be an enjoyable diversion. But what makes Battle Creek as intriguing as it is fun is that the story continues to strongly suggest that Russ is right about Milt: he isn't what he appears to be, and Milt's gentlemanly manners and ingratiating smile are slowly revealed as a façade. Moreover, Russ is self-aware enough to know that his initial suspicions were born of jealousy, as the eminently personable Milt began to undermine Russ' longstanding role of de facto leader of his cop shop. The result is that even as his suspicions of Milt are gradually confirmed, Russ is still compelled to face up to a growing realization that he perhaps isn't as jaded and broken as he himself pretends to be. Mismatched buddy-cop stories are nothing new. They have long history on the big and small screen – from films like In the Heat of the Night, Lethal Weapon or Canada's Bon Cop, Bad Cop to TV shows like the delightful but cancelled The Good Guys on Fox (which was most on my mind when I tuned in Battle Creek for the first time) or USA Network's slick and smooth White Collar. For all that however, Battle Creek – with its unique application of the old trope of pairing a cynic and a romantic – seems to more deliberately call back to one of my all-time favourite series, and does so without missing a beat: namely, that Platonic ideal of the grizzled cop meets Special Agent Dudley Do-Right series that was Due South. 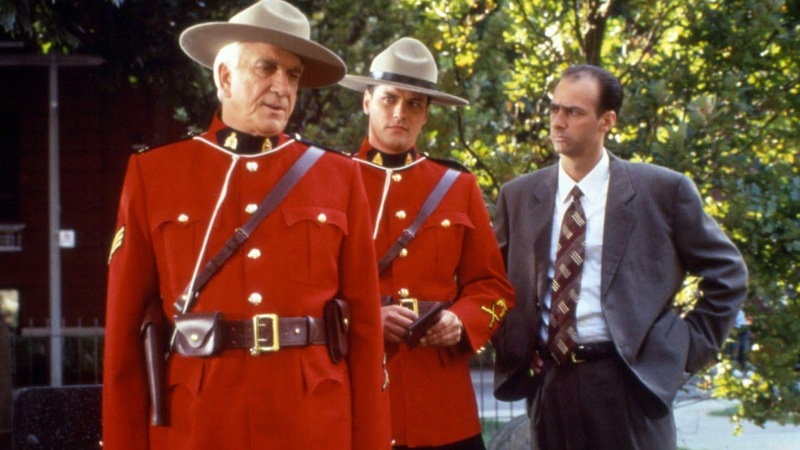 Leslie Nielsen, Paul Gross, and David Marciano in Due South. But none of this should come as any surprise to a Canadian viewer, with David Shore at the helm of Battle Creek. Before he joined the team behind NYPD Blue and before he created House, the Canadian-born Shore's first full-time writing gig was on Due South back in 1994, where he wrote and co-wrote some of the series' best episodes while still working as a lawyer. In a way, Battle Creek is very much a return to form for Shore, but with a significantly contemporary take – now asking, "What if Constable Fraser truly wasn't what he seemed to be?" What is becoming ever more impressive with every episode is that Battle Creek continues to succeed in having it both ways: to Russ' growing frustration, Milt's continuing appeals to people's better angels actually work. Even as we (and Russ) know that Milt isn't who he pretends to be, the story implies that the world just might be more like Milt than Russ. (As Milt puts it in a recent episode: "I'm not lying. But even if I was, would anything I've said … be any less true?") Is Milt a sociopath? Is he making good on a past ill, or hiding out in Battle Creek, or both? However little we (and Russ and the team) really know about Milt (and we don't know very much), his impact on Battle Creek remains quite real, and almost across-the-board positive. Though nothing about Milt may be what it seems, that ironically makes him both less infuriating and more intriguing to the cynical Russ – because Milt being a self-serving liar better fits Russ' worldview. This twin tension – Russ' world being undermined by a sentimental naïveté that seems to actually bear out, and the growing suspicion that Milt may be more cynical than even Russ himself – binds them together and creates a tense and singular kind of onscreen partnership. On Sunday at 10pm, Battle Creek will air the seventh episode of its 13-episode first season. Catch up on the earlier episodes on On Demand, and tune in on Sunday nights while you can.